The decision to leverage a lockbox within your receivables mix—whether run internally or outsourced—is no small undertaking. 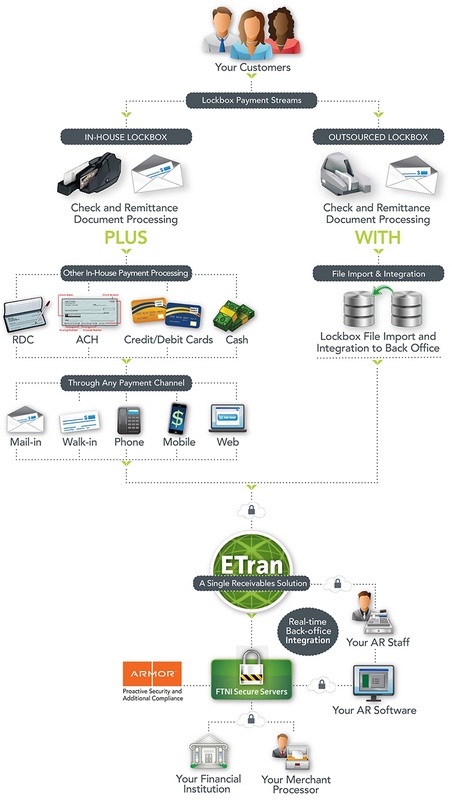 FTNI's Integrated Receivables platform, ETran delivers affordably implemented, easily configurable and conveniently maintained lockbox processing solutions including advanced Remote Deposit Capture (RDC), remittance document scanning, and seamless posting of payment data to your back-office system. Currently in use within corporate in-house lockbox operations, banks and third-party operators, ETran will provide the flexibility and configurability you need to streamline the acceptance, processing and posting of your lockbox remittance items. FTNI's ETran is a cloud-based, fully integrated receivables processing platform that can be used as the engine of an internal lockbox operation. 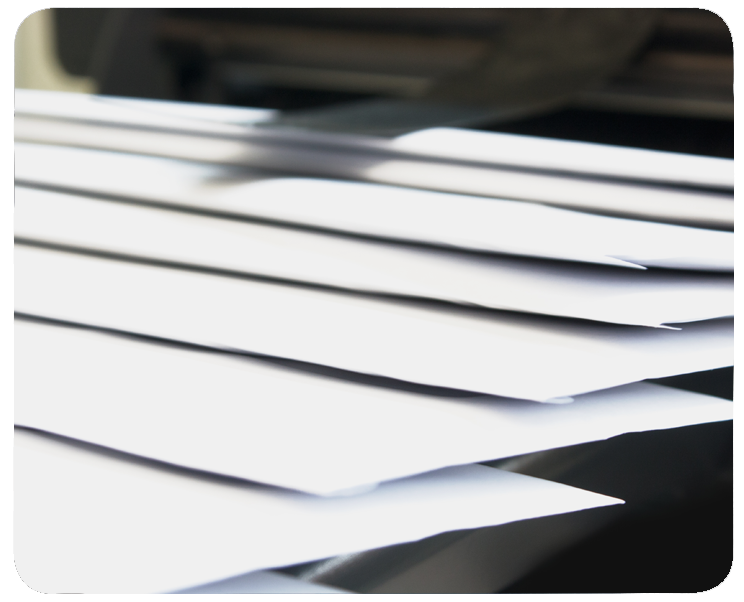 ETran is currently in use driving lockbox operations at firms processing as little as a few thousand checks and remittance documents per month, yet it is also powering lockbox operations processing nearly 1 million checks and associated documents monthly. 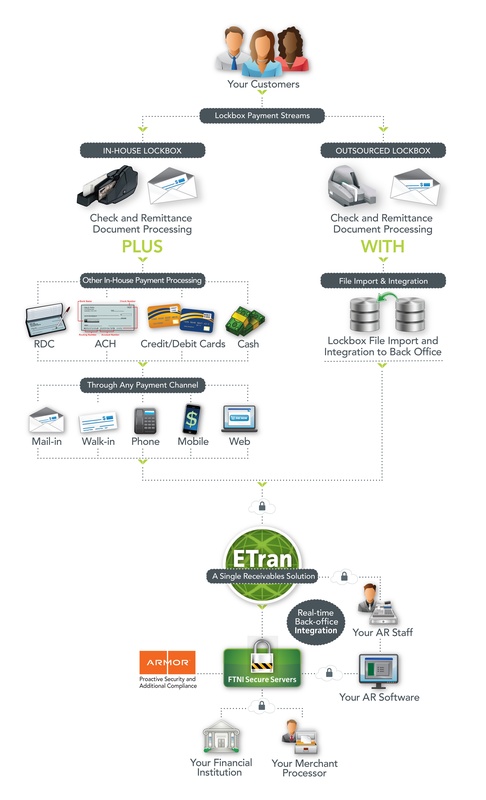 With ETran, your company benefits from on-demand scalability and seamless integration capabilities with your existing banking relationships, as well as any accounting software and other back office systems to automate the processing and posting of payments in a single pass – i.e. straight through processing. See How Physicians Mutual Has Accelerated Lockbox Operations by Nearly 75 Percent in the First 30 Days on the ETran Platform. Along with the benefits of outsourcing your lockbox operations, there can unfortunately also come some common 'headaches'. One of the most common is having to deal with receiving limited remittance data associated with lockbox items that many times still has to be manually reviewed and uploaded into your back-office and CRM systems. Each time another set of eyes has to view a payment, it costs you money. ETran will help you bridge the gap between your outsourced lockbox provider's data feed and your systems — automating historically manual, time-consuming and error prone processes supporting the posting of payment and remittance data to your back-office systems. 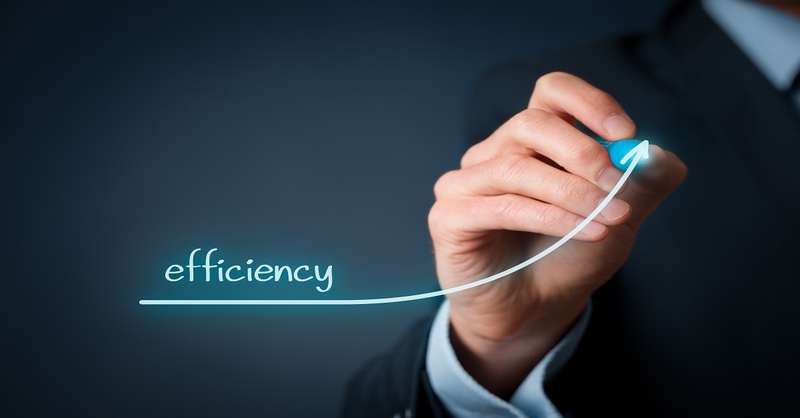 Commonly referred to as 'consuming the feed' from your lockbox provider, ETran's back-office and bank agnostic nature allows it to take information from your outsourced lockbox and information from your business' systems and successfully match them via an automated process based on your unique business rules. Then, ETran can feed that data into your back-office and CRM systems in either batch or real-time. Why is this important? Consuming and matching the transaction data with the appropriate customer accounts for automatic posting helps eliminate manual processes currently used to manage disparate, siloed information, and let's your employees focus on higher-value functions such as exception handling. It also helps businesses establish automated workflows and allows for more robust reporting and AR oversight. ETran's SaaS architecture gives you the benefit of multiple layers of compliance and proactive security. At the application layer, ETran is both PCI and HIPAA compliant. Additionally, you (and your customers) will benefit from an additional layer of compliance (PCI, HITRUST/HIPAA, SSAE16 and more) and proactive cyber security operations from our hosting partner, recognized secure cloud-hosting provider, Armor. Efficient, well-functioning lockbox operations and processes provide businesses with increased flexibility, streamlined efficiencies and in-depth AR oversight. Leveraging a real-world, proven platform can provide your business a secure, competitive and operational edge. Ready to learn more? Contact us, view the ETran demo and visit our Data Sheets library.